I never liked it when a restaurant closed its doors for the last time. Finality like that always bothered me. I think restaurants are generally honest businesses, begun by people who love food and want to share that love. Closing one down for whatever reason always seemed like a tragic shame. I just never thought it would happen to my favorite restaurant. I can’t tell you exactly when my family and I started coming to what would be the best dumpling house we ever found, just like it’s hard to pin down the beginnings of any family tradition. Tucked away in somewhere in Manhattan’s labyrinth of a Chinatown, there was a tiny, dingy little restaurant we frequented until, one day, we found it closed with a new address taped to the door. 100 Mott Street. That’s where the note pointed us and that’s how we came to know it. 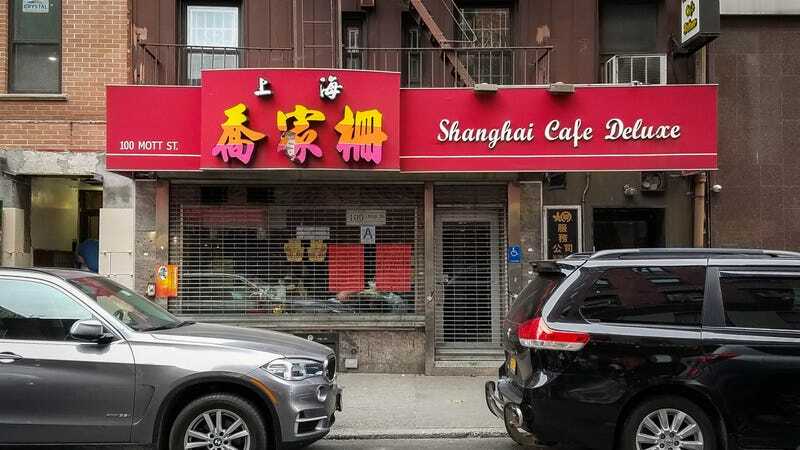 The restaurant had an official name, of course—Shanghai Cafe Deluxe—but that was a hodgepodge of anonymous words. (We didn’t learn its proper name until we started bringing our white friends by.) To us, it was just 100 Mott Street. Cash only. Inside, it was tacky. Garish, pink neon lighting criss-crossed the ceiling. But that didn’t matter because you don’t go to a Shanghai-style restaurant for the decor. You go for the dough. Chewy Shanghai-style thick noodles. Stir-fried sticky rice cakes. Shengjian jian bao: pan-fried pork buns with thick, doughy skin and a crispy bottom. And, of course, the soup dumplings. The xiao long bao. A carb lover’s fever dream. There was a trick to eating these delightful little baozi (a Chinese-style steamed bread roll with a meat or vegetable filling. Xiao long bao translates to “little basket bun.”) They’d come to the table in bamboo steamers with eight apiece. You’d pick one up, bite or poke a hole in the skin and let the fragrant juices spill out into a spoon. You’d wait for the dumpling to cool and then eat it, slurping the soup out of the spoon afterwards. Over the years, we brought everyone by. Family members, distant relatives, friends. As my brother and I grew through our teens, late teens, and into adulthood, our guests began to include girlfriends. Boyfriends. Hell, I even brought my boss once. We taught each of them how to eat the xiao long bao, smiling encouragingly when the baozi slipped from the ends of plastic chopsticks wielded by inexperienced fingers. It was a rare chance for us to teach our friends a little bit about our culture, instead of the typical other way around. I moved 3,000 miles away for university during my junior and senior years, the furthest I’d ever been from friends and family, but whenever I’d come back during the holidays, we’d go to 100 Mott. It was a cozy feeling; knowing that, despite building a new life for myself on the opposite end of the country, I still had this steamy little dumpling restaurant to come back to for a little taste of home. Like a childhood home, there was a physical address to go to, at which delicious flavors of familiarity could still be found. Even after my brother and I moved to the city, the two of us would still go by ourselves, keeping up the tradition of ordering without ever opening a menu. As the years went by, 100 Mott gained popularity. It was written up on Zagat. A Michelin sticker appeared on its door one day. Selfishly, I was very worried about these reviews. Fiercely protective, I had come to think of it as my dumpling house, my secret. Let the other New Yorkers have their dim sum at the flashier restaurants. I didn’t want the integrity of my restaurant to suffer. Because I had seen it happen before. A restaurant would gain popularity. Foot traffic would increase and the quality of the food would deteriorate. Quantity over quality and all that. As word spread around the city, the line for a table grew longer and longer. Especially at noon on Saturdays and Sundays, when the front of the restaurant would be packed with people looking to get some “brunch” and “dim sum” at a restaurant that traditionally wouldn’t serve Cantonese-style food. Yet, the quality maintained. As did the brusqueness of the service. Despite my many visits, I never established a relationship with the serving staff. They always moved at a lightning pace, at incredible rates of speed and efficiency. Having a meal at 100 Mott wasn’t so much as a dining experience as it was sport eating. The time between placing the order and having the food hit the table was never more than 10 minutes. I saw a waitress argue for a higher tip on a bill. I saw the hostess give a four-top away, right out from underneath two people who had been already seated there; instead of leaving in a huff, they got right back in line to wait for a new two-top to open. Shared tables. It was madness, certainly intolerable in the greater Manhattan dining scene, but also something that was so familiarly Asian. 100 Mott made sure you never forgot that it was a business. You were there for one thing only: Eating. Take your date elsewhere if you wanted to sit and “talk.” It was admirable. I should have known that it wouldn’t last. Notice: Shanghai Cafe Deluxe will be undergoing renovation from March 28, 2018 to April 2, 2018 & will be temporarily closed for business. Business resumes on April 3, 2018. Thanks. I felt a stone drop into my stomach. I texted my brother. Expletives slipped from my fingers. We wandered around Chinatown a bit, finally settling on a Cantonese restaurant a few blocks away. I picked at the food. It’s now July and the signs haven’t been moved. The gate hasn’t been lifted. Calls go unanswered. I guess it shouldn’t surprise me. It wasn’t until I did a little digging online did I stumble across an article that reported ex-employees allegedly suing the restaurant for breaking certain labor laws. Given the all-cash nature of the business and how restaurant staff would argue with patrons over tip amounts, it made sense. It also broke my heart a little more. Exploiting restaurant employees is a horrible thing to do and I was sad that my restaurant might have been guilty of it. I could have branched out more during all those years of coming to Chinatown. Gone to different places. Found a few other joints to call homebase. But that’s the thing about homebase, there’s only supposed to be one of them. The place. The place where I spent the last 15 or so years of my life having lunch and dinner. The place where I’d visited enough to have sat at every single seat they had inside. The place where I always left full and happy and never had a sub-par meal. 100 Mott was a tradition that was, in a way, passed onto me by my parents. It went beyond just a good xiao long bao (although that certainly helped). I’m not sure I’ll manage to replace it. And you know what they say about nostalgia: Things will never be as good as they are in your memory. I hope this doesn’t apply to soup dumplings, too.